The beginning of spring means it's time to clean house, but tidying up your messy closet doesn't have to be daunting. These organizing storage tools can help you achieve the closet space of your dreams. Why You'll Want It: Make it easier to store and quickly find cleaning supplies with this utility hanger for brooms, dustpans, and other household items. It can keep up to seven cleaning tools in place with the help of rubber pressure clamps—all while helping you save space. Why You'll Want It: This copper wire frame basket—available in small and medium—is a great solution to decluttering your life. The container allows you to easily view what’s inside and the label compartment on the front ensures you'll be able to keep track of what's stored. Why You'll Want It: These nickel-plated, wall mounted hooks—which can grip up to 5 pounds each—make it easy to flip open storage when you need it and flick it away when you don’t. Why You'll Want It: These slim and sleek hangers are designed to maximize closet space as well as keep shirts and dresses firmly in place with non-slip velvet material. In addition to a frame sturdy enough to support up to 10 pounds, the hangers have contoured shoulders that protect your clothes' original shapes. They come in packs of 30, 50, and 100. Why You'll Want It: Divide and conquer: Avoid chaotic shelves with these 8-inch-high acrylic dividers that claim to be "stronger than glass." Why You'll Want It: No matter how you fold, stack, or roll your socks, bras, or underwear, it’s tough to keep drawers tidy ... until now. This drawer and closet divider keeps items neatly organized in separate bins to get the most out of small spaces. Say goodbye to the days of digging around a drawer for a pair of matching socks. Why You'll Want It: If the bins above aren't your style, try these plastic honeycomb-shaped drawer organizers. They can hold up to 36 items (across all three sets) and make it more convenient to pick out the perfect pair at a glance. Why You'll Want It: This organizer won’t leave you hanging when it comes to keeping your odds and ends together. The see-through pockets are suspended from the top of a door, and keep your items tidy. It holds up to 24 pairs of shoes, but can also be used for any other household items like cleaning supplies, toiletries, and office supplies. Why You'll Want It: Have an extensive shoe collection, but very little space to store it? Shoe Slotz allow you to stack shoes on top of each other instead of storing them side-by-side. Why You'll Want It: These natural, non-toxic, and chemical-free air purifying bags promise to effectively kill off any molds and mildew by absorbing excessive moisture. They are also reuseable for up to two years. Simply place the purifying bags outside in the sun for an hour once a month to refresh. Why You'll Want It: These 3-ounce spice tins aren't only helpful in the kitchen. They can also be used in other locations in your home like in a storage room or closet. Each pack comes with 12 metal tins, each with a small screwable lid that features a see-through window as well as a magnetic bottom that can be securely placed on any flat metal surface. Use them to store small household items like spare buttons, bobby pins, and cufflinks. Why You'll Want It: This canvas hamper hangs from a doorknob or in a closet, keeping laundry out of the way without adding too much bulk. Why You'll Want It: Made from soft cotton rope, this woven storage basket is practical enough to stash books, toys, clothes, or other items out of sight, and stylish enough to keep in your living room in plain sight. Why You'll Want It: Double up on storage space with this chrome closet doubler. 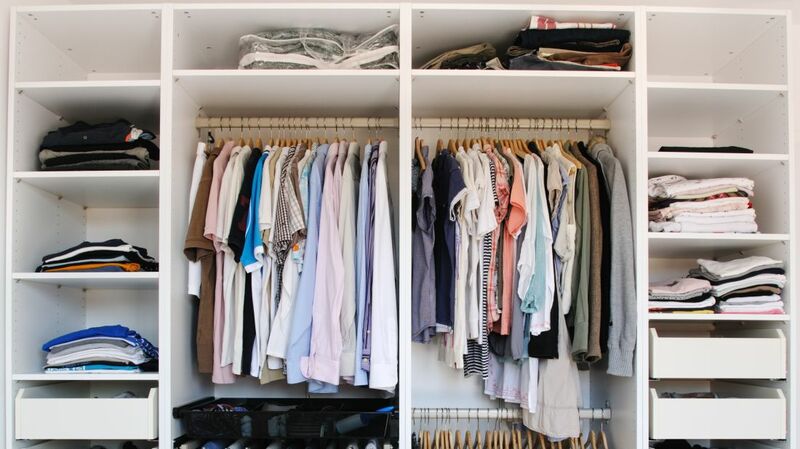 It extends your closet space with two sturdy rods instead of one, allowing you to hang shorter items like tank tops and sweaters on the top rack and longer garments like jackets and pants on the bottom. Why You'll Want It: Turn your reach-in closet into a stylish walk-in with this configuration kit from Rubbermaid. It can help you transform your space into smart storage for all of your clothes, shoes, and accessories with simplicity and ease. The kit includes adjustable shelves, brackets, hooks, clothing rods, and more. Why You'll Want It: Instead of placing purses on the top shelf of your closet, this purse organizer, which holds up to eight handbags, simply hangs them from a closet rod. You can also store blankets, sheets, bedroom linens, shoes, and even yarn with this space-saving organizer. Why You'll Want It: This motion light sensor is ideal for closets, storage rooms, utility closets, or any other location where you don't have access to an outlet. The no-fuss, battery-powered light is easy to install with a sturdy adhesive or a series of secure screws. It even detaches and doubles as an emergency flashlight. Why You'll Want It: This retractable sliding rod (measuring about 7 inches when extended) can be used for hanging a single item, such as an outfit for the next day, a wrinkled dress or an Oxford shirt for steaming, or a garment bag. The best part is the valet rod simply slides back into its sheath whenever you don’t need it. Why You'll Want It: Turn one hanger into 23 with this chrome scarf loop and tie organizer from Deco Bros. It can also store belts, leggings, and other items. Why You'll Want It: Out of room, no matter how much you organize? Create more closet space with this easy-to assemble steel chrome garment rack. It’s perfectly suited for hanging shirts, pants, and dresses with top and bottom storage areas for hats, bags, and shoes. The garment rack also features four locking wheels for portability. Why You'll Want It: And what’s better than using a garment rack? Using its matching garment rack cover, so your unmentionables remain unmentioned. This garment rack cover is made from heavy-duty canvas to keep clothes and shoes protected from dust, dirt, and mildew. It also features button closures for quick fastening and tying the cover open for easier use. Why You'll Want It: This scratch-resistant loop hanger is the best way to keep all of your belts, ties, scarves, and purses together and organized without sacrificing precious closet space. Why You'll Want It: Instantly increase your closet space with these durable space saving hangers. Made from stainless steel, these hangers include six slots and two hooks and can store up to 12 garments when in the horizontal position or six when vertical. Each pack comes with four hangers, so you can store up to 48 garments with ease.